« West Burnaby THURSTON STREET Townhomes & Condos for Sale by Anthem Properties! FINAL RELEASE! Featuring a great selection of studio and 1 bedroom view homes for a great investment or a great place to live! BUY NOW at Evolve Surrey Condos and get up to a $30,000 discount on Surrey real estate’s best view homes. Construction is well underway so visit their presentation centre that features 3 show homes! LAUNCHING SOON! 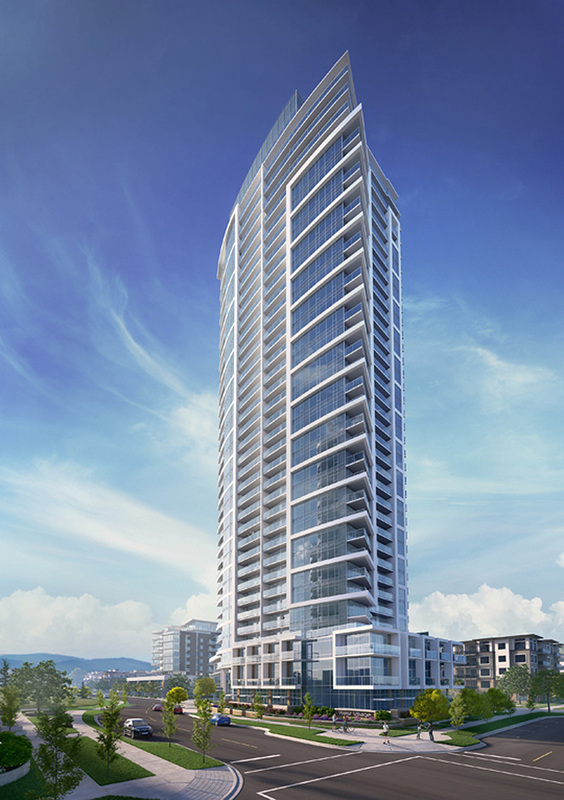 The newest high-rise condominium tower in Surrey City Centre real estate district is coming in early 2015! Brought to you by WestStone Properties developers, the new Evolve Surrey City Centre condos puts you centrally within close access to shopping, post-secondary education, local businesses, shops and restaurants of all types. Located in one of BC’s most vibrant new neighbourhoods, the new Evolve Surrey City Centre condo tower by WestStone Group features easy commutes to work as well as a diverse array of both arts and culture. An incredible presales price point starting from less than $100,000 for studio plans and 1 bedroom plans around the low to high $100,000’s, the new WestStone Evolve Surrey condos will be truly affordable for today’s homebuyer and first time purchaser. These price points are cheaper than woodframe condominiums in the area too! And the presales is like no other with interactive 3D plans and renderings available for prospective buyers! You can simply download the Surrey Evolve Condos 3D app from Google Play or the iTunes App Store, open the app and point your device marker to view the 3D content and then experience the true evolution of affordable luxury. The landmark tower will rise 35 stories in the Surrey City Centre skyline and will also feature a spectacular SKY Floor Amenity Level. There is a fully equipped gym/fitness room, theatre/multi-purpose room, lounge area, social room with kitchen, meeting room, sky patio & lounge with kitchen with great mountain and city views, garden paths and secured bike parking. The new Evolve Surrey condo tower is primed to become the landmark residential tower in the Surrey West Village community that is both sustainable and liveable. 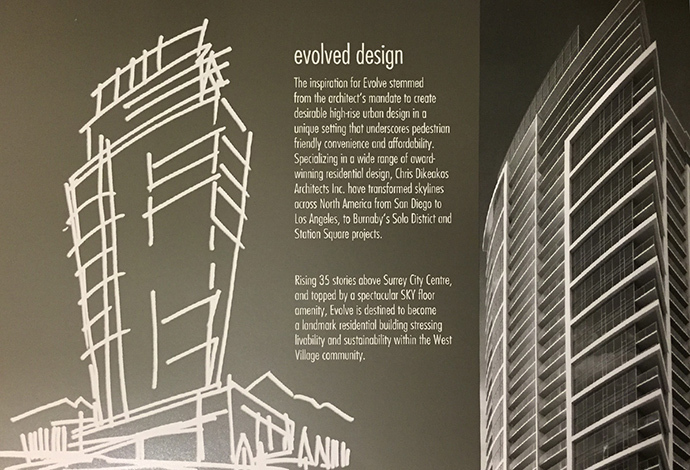 The inspiration for the striking architecture at Evolve by WestStone Properties came from the architects’ mandate to create a desirable residential high-rise urban design in a unique setting that underscores pedestrian friendly convenience and affordability for all. Chris Dikeakos Architects achieves this and much more here in Surrey Central City as they have in Burnaby’s Solo District and Station Square master planned communities. There will be 2 designer selected colour and finish palettes during the presales phase of the Surrey Evolve condo tower release that includes: ECLIPSE which is dark contemporary wood grain cabeinetry, earth toned tile and a natural colour palette in addition to EQUINOX which is a light contemporary wood grain cabinetry, neutral tile and classic colour palette. Other home features include easy to maintain engineered hardwood floors in the living/dining, den, bedroom and entry. There is contemporary polished chrome hardware and low VOC paint throughout. The homes will also have over height 8.5’ ceilings throughout, large windows and spacious balconies. The presales Surrey Evolve Condominiums will also feature luxurious bathrooms complete with elongated mirrors with medicine cabinetry, quartz counters, dual flush toilets, polished chrome fixtures, stylish rain shower head in main bath and contemporary porcelain tiled floors. The refined kitchens at the preconstruction Surrey Evolve condos include soft close hardware and elegant modern cabinet pulls, quartz backsplash and counters and a stainless steel under mounted sink. The quality stainless steel appliances selected for the Evolve Surrey condos are by GE and include an Energy Star freezer/fridge, dishwasher, large capacity range and one touch self clean oven in addition to an over the range integrated microwave/hood fan and Energy Star stacker washer and dryer. Here are some of the draft floor plans at Evolve Surrey City Centre condos from smallest to largest. Again, these are all draft layouts that are subject to change at any time. Welcome to West Village Surrey! The extremely liveable and affordable Surrey City Centre property market has become genuinely loveable at its heart with arts, culture, convenience and social engagement. This is no random evolution though, as it is the result of deliberate well considered planning for decades and the thinking that has gone into the creation of West Village Surrey real estate district. Here at the Surrey Evolve Condominiums by WestStone Properties, home buyers will be treated to the most exciting new neighbourhood in the Lower Mainland. Throughout the area, the WestStone Property Group has won numerous awards for their keen focus on planning, use of innovative materials and intelligent design to make condo living more liveable and affordable in today’s market place. These forward thinkers build with future generations in mind, and the new West Village Surrey Evolve condos in Surrey City Centre are certainly no different! The vision for West Village Surrey includes a green grocer that sources local produce and other products, great restaurants, shops, boutiques, cafes, a specialty liquor store, office and business space. People from all over Metro Vancouver will join friends in the gathering places at West Village Surrey, observe arts displays and events of the cultural commons in addition to playing in the numerous outdoor active areas. Street trees and soft landscaping, benches and banners, distinctive paving patterns, public art work and weather sheltering canapies are all there deliberately to create unifying elements that thread the various parts of the Surrey West Village district together and make it more liveable and proof that today’s communities can be both affordable and exciting. Those who live, work, play and passthrough the area have multiple reasons to slow down, explore, strike up a conversation and smile. These are just some of the great community features that homebuyers at the presales Surrey Evolve Condos in City Centre can look forward to! 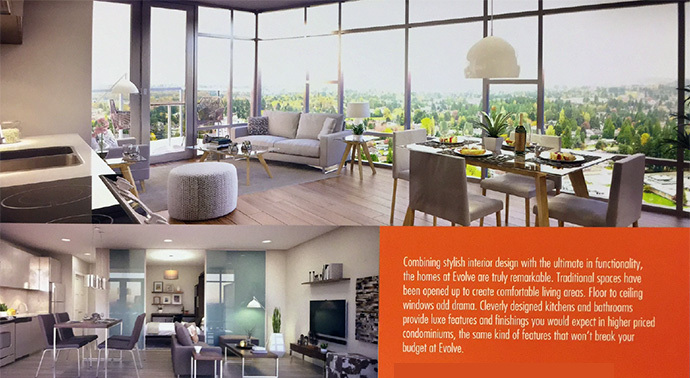 Here is some of the presales information from their marketing brochure: “Combining stylish interior design with the ultimate in functionality, the homes of Evolve Surrey City Centre are truly remarkable. Traditional spaces have been opened up to create comfortable living areas. Floor to ceiling windows add drama. Cleverly designed kitchens and bathrooms provide luxurious features and finishings you would expect from higher priced condos, the same kind of features that won’t break your budget at Evolve Surrey Central condos. In addition, residents can enjoy spectacular and truly breathtaking views of the North Shore Mountains, Mount Baker, sunsets to the west and much more. The new Surrey Evolve high-rise condos will also feature a penthouse amenity level where you can enjoy a clubhouse style lounge area, meeting room or outdoor patio.